Geometra Software AB | Let’s talk business! 07 Feb Let’s talk business! This post marks the first in a series of blog posts which will be written on a regular basis by us in the coming year. The series will cover topics such as entrepreneurship, new features, updates and tips and tricks in the usage of Geometra. A month has already passed of the new year and what you are reading here is the first blog in a series of posts that we will release from Geometra Software. If you followed us during the last year you may certainly have noticed some changes. We renamed Sjobeck Prime AB to Geometra Software AB and I assumed my role as the new CEO. The first time I came in contact with the company was through ALMI where I’m a mentor and my first adept were Fredrik, at the time the owner and CEO. After a successful year together, we decided that I should start working in the company and that was the start of our journey. The road for me to Geometra Software went through working at AstraZeneca in Lund where I did drug development as a medicinal chemist. I studied chemistry and hold a Ph.D. from the Chemical Centre at Lund University. At AstraZeneca I had several different roles such as, a manager and a leader of several projects according to LEAN. After AstraZeneca I joined Maersk in Copenhagen where I worked with IT and Business Intelligence, BI, which I hope to return to later this year, as it is an interesting topic for many entrepreneurs even without thinking about it. As mentioned before, I have been a mentor at ALMI for many years and have had the privilege to meet many entrepreneurs whom I have coached and helped with their businesses and personal challenges. So, with these experiences, I want to run and develop Geometra Software on its journey going forward. It was not entirely true that this is the first blog post. We started earlier this year with an annual review of our product Geometra and a newsletter. Our intention is to post a blog every week with a different theme, which we will summarise each month in a newsletter. In my series, I will discuss what I see as the biggest challenges that many CEOs and entrepreneurs face in their daily work. Planned topics are economy, the importance of creating a budget, staff management, why do I run a business, work planning, etc. (Perhaps I will even add something about Triathlon training). During my time as a mentor and the work I have done with various businesses I’ve encounter many of these challenges. Challenges which I’ll touch upon in the coming posts. In the other two blog series Fredrik will talk about updates and development of the product while Christoffer will be compiling helpful tips and tricks on how to get the most out of Geometra. As previously published, we have released a completely new version of Geometra, which we call generation 3 or G3. This new version includes a whole new technique for managing PDFs as well as a new and improved user interface. It got a little cool reception to start with which we have been working hard to change and now we see a much better adoption rate of the new version and if you haven’t tried it yet, I highly recommend you take it for a spin. There are some new cool features you should see. Just contact our support if you need any help. Another great thing is to follow us on Twitter to get the latest update of the Geometra status. Click here to follow. As I look forward to 2018, I expect that we will have a new and exciting year ahead of us with further development of Geometra together with you as customers and users. We are very grateful for all feedback we received and look forward to more in the coming year. We have also initiated a collaboration with Byggvarulistan, which I will discuss more closely later in the year. 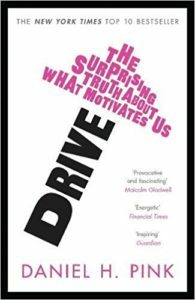 This month’s book tip: Drive by Daniel H. Pink. In this book book Pink tackles the topic of what is motivating for us as individuals both privately and at work.